Sometimes it pays off to take the back roads and shortcuts. I’ve always found Yuma to be a bit challenging when it comes to finding a righteous breakfast. Actually, on my previous trips, my best breakfasts have all been out at the Proving Ground, that being the breakfast burritos from the bowling alley, and Sidewinder Cafe (the food truck across from Luguna Airfield and the Free Fall School). And in town, I’ve done all right at Brownie’s Cafe, and found that Arizona Donut has a surprisingly good breakfast burrito, but in general, I haven’t been wowed. However, on last June’s trip to Yuma, I took a shortcut from Burger’s n’ Beer on 20th street back to my hotel on Hwy 95, which took me through the residential area east of 4th Ave. Heading north on 1st Ave, between 19th and 20th Street I saw this little unassuming neighborhood grocery store call “Stan’s Grocery”, and I noticed their sign said “Voted Best Breakfast Burritos in Yuma.” I put it on my “Hit List” as a place to check out the next time I’m in town. Doing a little bit of web searching, and I discovered that the sign had some merit to it. Several review sites have given their breakfast burrito really high marks. Several locals I asked gave it good marks as well, and the Yuma Sun has given it “Best Burrito” awards going back at least 10 years. So, while my usual schedule when in Yuma requires me to be at YPG at a ridiculously early hour of the morning, this trip I had two mornings where I found myself in town instead out at the airfield. So I gave Stan’s a try. I’m glad I did. While the ambiance is your basic mom-and-pop mini-store, they’ve got quite an impressive list of breakfast burritos, with most any combination of eggs, beans, potatoes, and various meats (chorizo, bacon, sausage, machaca, and asada), with a few tables in back for those people dining in (the vast majority of the business is takeout, and I easily saw 50 burritos go out the door while I was eating mine). 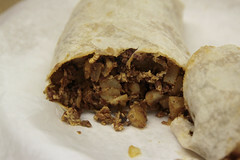 I opted for the chorizo, egg, and potato burrito. Burritos don’t photograph well, but this was a seriously good breakfast burrito. They started with a nice, fresh, soft tortilla from one of the local bakeries. Inside were some nicely crisped fine-diced potatoes that weren’t starchy. Add in some perfectly scrambled eggs and some crisp, spicy, and non-greasy Chorizo, and you’ve got a solid burrito that was both more flavorful and heftier than most of the other burritos I’ve had around town. Top it off with a selection of good fresh salsas, and you’ve got a real winner. As far as I was concerned, this place is indeed a winner. It’s got it’s downfalls, namely little seating, and sometimes big crowds (they’ve got only a simple range with 2-3 people working it). On the other hand, the quality is good and the staff friendly (the owner, JoAnn, is really friendly and outgoing). I enjoyed it so much, I hit them up again on my way out of town last Friday…. Back in the day, when the Yuma Sun was an afternoon paper and those of us who toiled to create and edit the pages started work at inhumane hours like 3 a.m., Stan's breakfast burritos were the post-deadline light at the end of a very long and very dark tunnel. Personal favorite: Egg, cheese, bacon and potato. This is a burrito that will carry you through dinner, no problem — or eat it over two mornings, share it unless you're planning to harvest a field of lettuce, dig a few ditches or otherwise perform feats of strength and/or calorie burning. 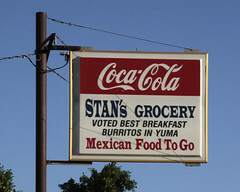 I could not agree more..Stan's was the best breakfast burrito i have ever had. I went with the Machaca, egg and potatoe..a true winner…and JoAnne was simply a gorgeous host and cared about her customers as they were related.